Oasis Dance Magic 2018 was amazing! Looking forward to sharing another truly amazing experience with you next year. SAVE THE DATES: August 9, 10 and 11, 2019. "BE so HAPPY that when others look at you, they become happy, too." "Staying positive does not necessarily mean that things will turn out okay. Rather, it is to KNOW THAT YOU WILL BE OKAY no matter how things turn out." March 31, 2019 - Brea, CA, at the Curtis Theater, "Shimmy Shakedown Festival." Fahtiem will be one of the international featured guest dancers. Starts 7:00 pm. May 31 - June 12, 2019. "Amazing Morocco Tour." Fahtiem will be teaching at the Mediterranean Festival in Morocco. Contact Fahtiem 626-810-SHOW (7469) ASAP if interested. August 9, 10 and 11, 2019. 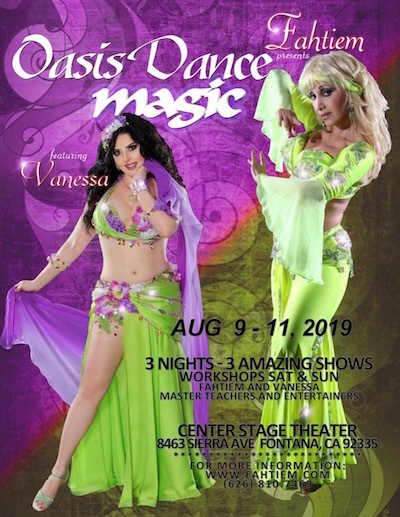 "Oasis Dance Magic." Special Guest Artist, Vanessa, will be teaching workshops as well as performing in the Saturday Gala Show. Three different shows and 10 hours of workshops. More information TBA. Fahtiem Wins Zaghareet Magazine's 2008 Lifetime Achievement Award! MON - Long Beach: Five week series. New session starts Jan 28, 2019 and ends Feb 25, 2019. Next session starts March 4, 2019 and ends on April 1, 2019. WED - Lakewood: Next session starts Feb 20, 2019 and ends Mar 27, 2019. Following session starts April 17, 2019. THU - La Mirada: Current session started on Jan 10 and ends on Feb 21, 2019. NO CLASS FEB 14. Next session Mar 14 and ends April 18, 2019. NO CLASS APRIL 11. FRI - Long Beach: Credit Class at Long Beach City College. Next Session Bellydance class starts in the Fall of 2019.